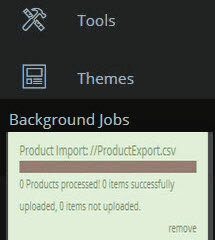 This form of Import is used for Advanced Pricing such as Customer Type Pricing, It is not recommended to do base Product Price changes in this Import. (number-no decimals) An OPTIONAL primary key, AmeriCommerce online stores internal pricing record number that this pricing is tied to. (number-no decimals) AmeriCommerce online stores internal product number that this pricing should be tied to. (text-freeform) The pointer to the product this pricing should be applied to, the item number field of the product. (text-ListItem) An OPTIONAL store to tie the price to, if stores offer different pricing, put each price as a row. (text-ListItem) An OPTIONAL customer level to tie the price to, if there are pricing levels, assign each level a price. (text-ListItem) An OPTIONAL variant specific price, combined with a variant surcharge. This allows quantity pricing for surcharges. (text-ListItem) An OPTIONAL variant inventory price, if you track variant inventory and want to supply a price for that variant inventory item, supply it here. (date) An OPTIONAL starting date for a price. Setting a date range for a price denotes it as a sale price. EndDate must be included if a start date is specified. (date) An OPTIONAL (if a start date is not specified) ending date for a price. Setting a date range for a price denotes it as a sale price. (text-ListItem) An OPTIONAL quantity pricing to tie the price to, just the break is stored, so if there is a break at 12, put 12 here and the new price. (decimal) The price to associate with this line item, this is what the customer will be charged. (text-ListItem) An OPTIONAL variant surcharge price, combined with a variant price. This allows quantity pricing for surcharges. (text-ListItem) An OPTIONAL price calculator declaration, if you use the price calculator supply it's name here to reference it. (true/false) WARNING: THIS CAN NOT BE UNDONE. When set to true, the particular advanced pricing will be deleted. 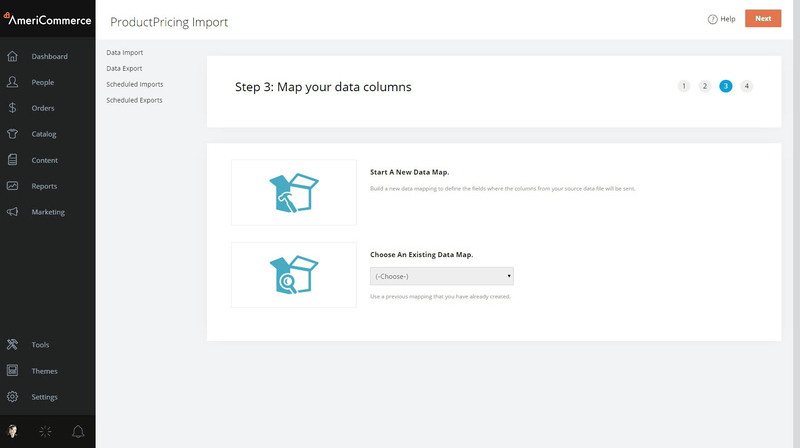 You may download a sample of this Import in Global Settings > Data Import Tools > Product Pricing Import. There will be a link at the top displaying the sample.This is useful in learning the Field Headers. The Column Definitions are also listed on this page. Select the Insert From icon next to Import File and locate your spreadsheet. Select from This Computer or the other location of the import. Select Click To Load to load the file into the processor. A mapping page will appear and this is where you can make changes to the default spreadsheet Field Headers based on your needs. Select Next and click Click To Validate Data and make sure there are no errors. 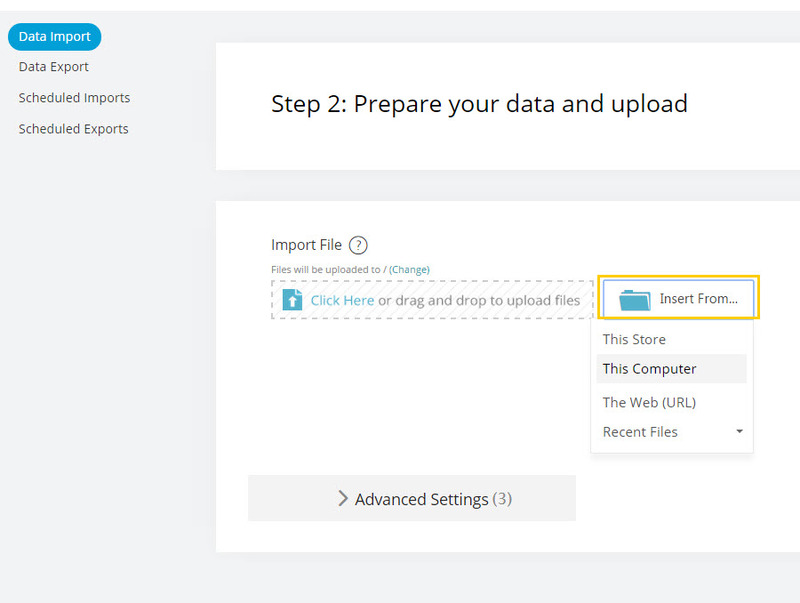 Click Click To Upload Data (finish) when you are ready for the spreadsheet to be processed and added to your store. Make sure to use the Validate Data link before you upload any data. Validation catches common errors and saves the hassle of having to correct mistakes. Once you are done your store(s) will be ready to show customer specific pricing to all visitors.